The Tampa Bay Lightning have already secured the best record in the National Hockey League, and playoffs are right around the corner. The Bolts have locked up home ice advantage throughout the playoffs, meaning games 1,2,5* and 7* (*if necessary) will be at Amalie Arena in Tampa in each round. First round tickets go on sale to the general public on Saturday, March 30 at 10 a.m. You can buy them HERE . Current Season Ticket Members will have access to a playoff pre-sale on Wednesday, March 27. Call 813-301-6600 or go to the Lightning’s official team website for more information. A special Lightning Insider pre-sale will occur on Friday, March 29 by clicking here . Tickets purchased through Ticketmaster for games that do not occur will be automatically refunded. There is a strict limit of four tickets per household for each game. Once playoff dates are finalized ticket-buyers will be notified via email. All tickets purchased online will be available through mobile entry. 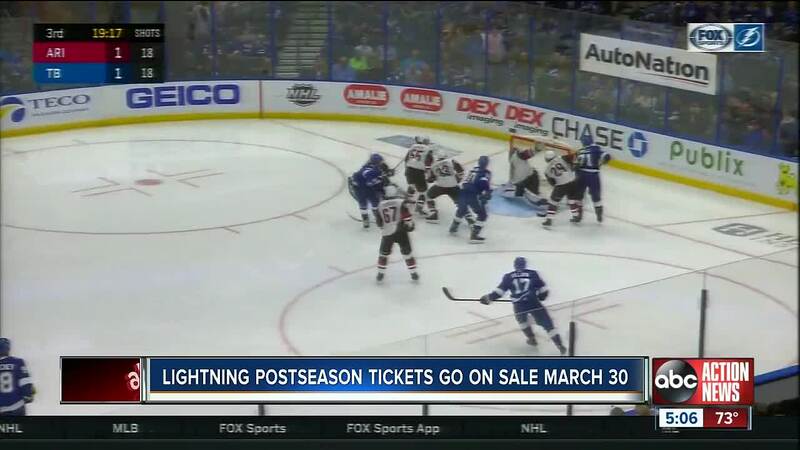 There will be no advanced sales for playoffs at the Ticket Office at AMALIE Arena. There will be a maximum of four home games each round. As of today, the Lightning would be taking on the Columbus Blue Jackets in the first round, but that could still change. Montreal, Philadelphia, Florida, Buffalo and the New York Rangers are all still in the hunt mathematically, and other teams ahead of Columbus could fall in the standings.